The AirSnore is a “boil and bite” device like the Zyppah, SnoreRx and other mouthpieces. Custom fitting the AirSnore is easy compared to other devices. Don’t be intimidated by boiling and fitting instructions for any anti-snoring device, the molding process is worth it, both for comfort and performance. The AirSnore is one of the simplest devices to mold to an impression of your teeth and gums. To custom fit the AirSnore you need a cup of boiling water, a cup of cold water, and a pair of tongs or a slotted spoon. Drop the AirSnore (with tongs or spoon) into the cup of boiling water for 20-30 seconds, then remove. Shake off the excess water and place in the mouth. Next, bite down moderately, not too firm. You can then use your fingers to mold the AirSnore around your top and bottom gum line. Place the device immediately in the cup of cold water to seal the impression. The AirSnore device instructions also contain detailed steps to custom fitting the product. 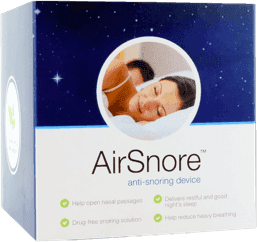 The AirSnore is a fixed in place mandibular advancement device. The lower jaw cannot be moved forwards or backward. The lower jaw alignment is nearly aligned with the upper tray. Because of the minimal advancement, the AirSnore is not a full Mandibular Advancement Device, but instead, a mouthpiece that forces mouth breathing. There is no adjustment. If the custom fit boil and bite did not work, you can re-form the device by retrying the boil and bite a maximum of three times.